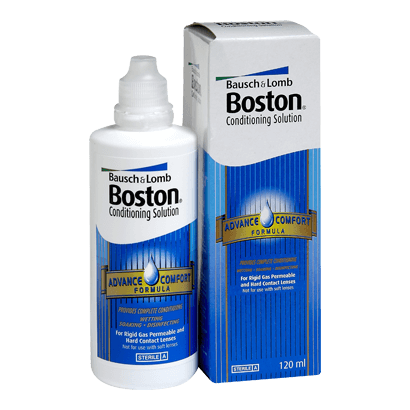 The Boston Conditioning Solution from Bausch & Lomb is an intensive cleaning solution designed for rigid RGP and hard contact lenses. Using a unique concentration of multi-purpose solution and intensive wetting agent, the product is able to keep regular users of hard contact lenses in comfort and confidence. The Boston Conditioning Solution can be specifically used for the rinsing, soaking and disinfecting of fluoro silicone acrylate lenses, silicone acrylate rigid gas permeable (RGP) lenses and hard contact lenses. By reducing the deposits and impurities that gradually build up on lenses, the solution is able to enhance the wearing experience of all users. The easy to use process of cleaning with the Boston Conditioning Solution is able to offer a reliable means of sterile cleaning and disinfecting to all wearer of hard contact lenses. By simply adding two to four drops of the solution on each contact lens and then carefully rubbing for 20 seconds, a wearer can diminish the impurities that can gather around lenses. The solution is able to surrounds the lenses with a soothing moisture system. This will leave hard lenses feeling smooth and wet, allowing a far greater level of comfort. The Boston Conditioning Solution is available now in bottles of 118ml. The solution can offer a dedicated means of cleaning and conditioning the harder types of contact lenses.